Now as some of you may know as of late, I have been trying to become more acquainted with the creatures of the sea. No, not Ariel and the rest of the gang – though that would be awesome too. I feel like fish is one of those taboo items that has only more recently been accepted into mainstream cuisine. Growing up, fish was not a main staple around the house. I think the fanciest we got was cooking some Orange Roughy and drowning it in lemon juice. 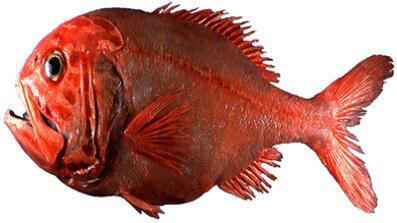 For those of you not aware, Orange Roughy is an extremely mild fish – void of that “fishy” flavor that is a turn off for some. It wasn’t even until the 7th grade that I tried my first piece of sushi. 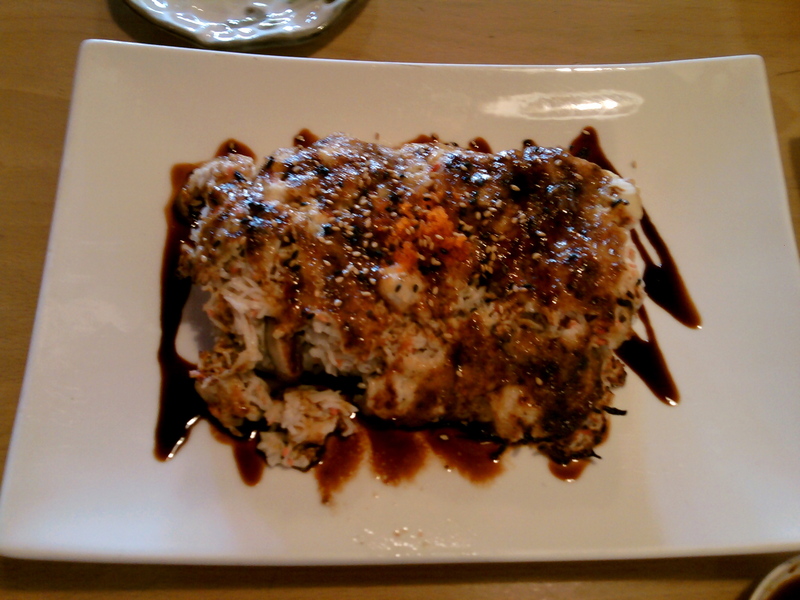 I remember it well, my tutor took me to a restaurant, Revolving Sushi, after I had gotten an A on a math test. 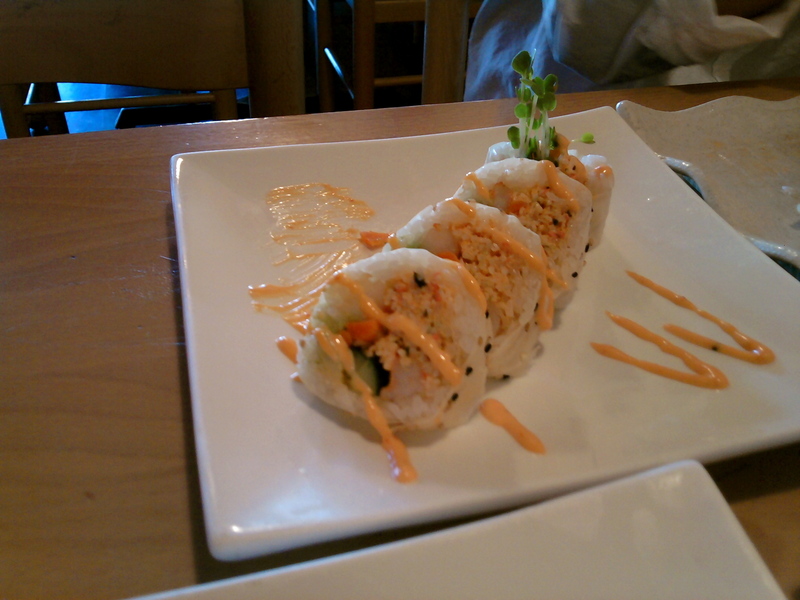 I ordered a safer roll, the Philadelphia Roll – I know, going crazy with some raw salmon and cream cheese. 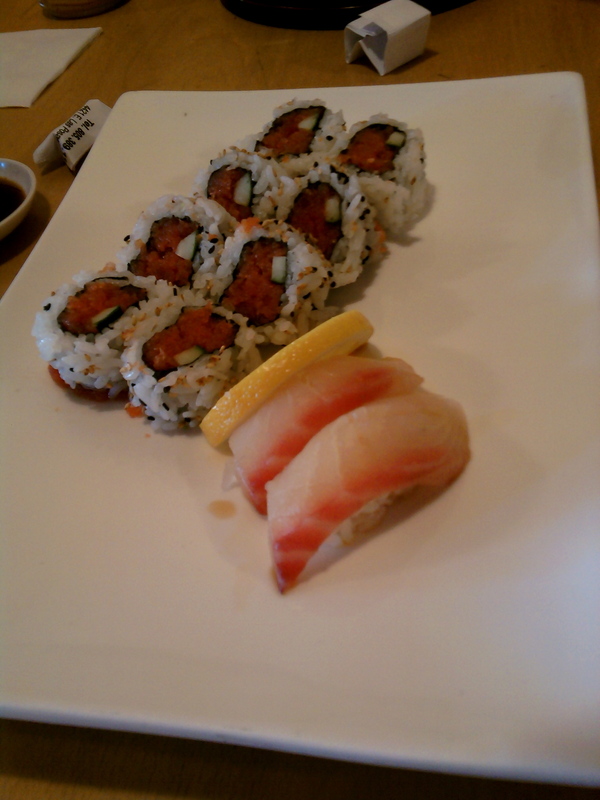 Since then, I have made a point to get try as much sushi as I can. After trying a lot of the different rolls I must admit that I favor baked rolls or at least a roll with a sauce. Whether this makes me a fake sushi lover I know not, just trying to be honest. Yes, there are actual rolls under there. They are just covered with more fish, smothered in sauce and then baked to perfection. This thing DEFINITELY required chop sticks. And a level of mastery with chop sticks at that. 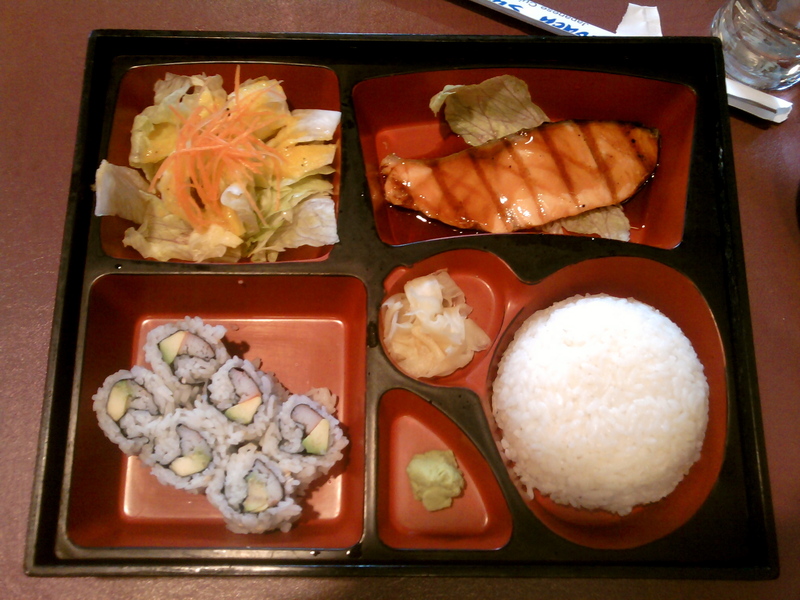 Another kind of seafood meal I like is the bento box. Traditionally a Japanese lunch box of sorts full of compartments for different components of your meal. They are aesthetically pleasing and allow you to prevent sauces and flavors from meshing on the plate. Got this lovely little box for about 7 dollars at a sushi joint in Oakland. I have even tried cooking fish more myself, as evidenced by some of my previous blog posts (Shrimp, Dover Sole), and those yet to come (Salmon, Mussels). 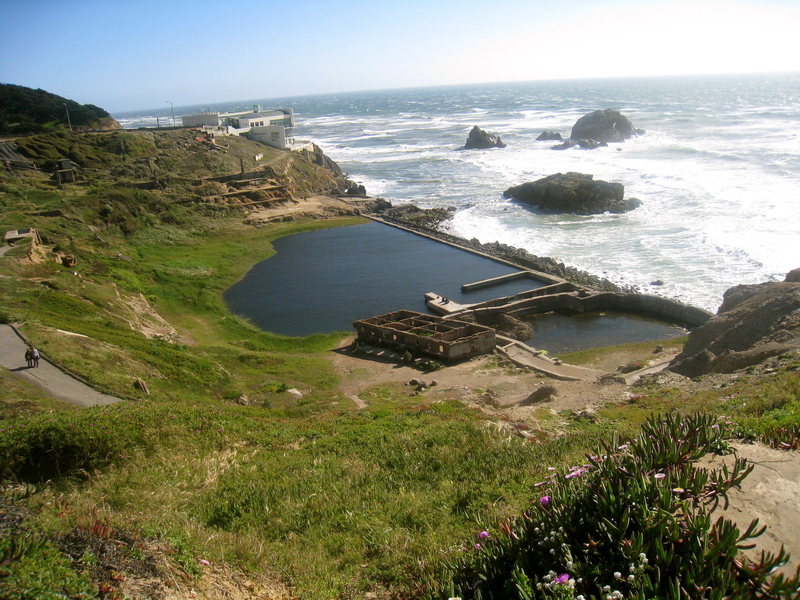 Earlier this week, after a particularity stressful day at school, Matt and I went on a little adventure down to the Sutro Bath House ruins. And scouting out for sailors lost at sea. After a few hours of exploring we were a little starved. We already had some homemade chili waiting at his house for us but needed a little pick-me-up. The famous restaurant, The Cliff House, was calling our name. Not gonna lie though, it’s one of those fancy restaurants where you should probably wear a tie and heels – accessories not meant for the same person. We felt a little under dressed walking in wearing sweatshirts, jeans, and obviously rocking some seriously windblown hair. Whatever. The hostess seemed to think it was cute. 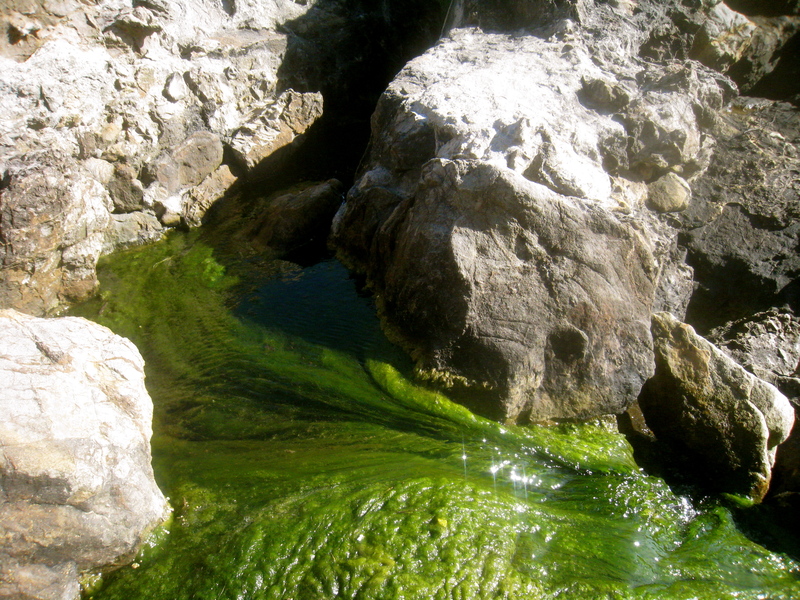 (Hope they didn’t see us climbing up the side of the mountain to get there). After surveying the menu, we agreed that seafood was the best choice. We were at the beach for Christ’s sake. We wanted to try a few things, so an order of Clams and an order of Oysters were just the things we were lookin’ for. 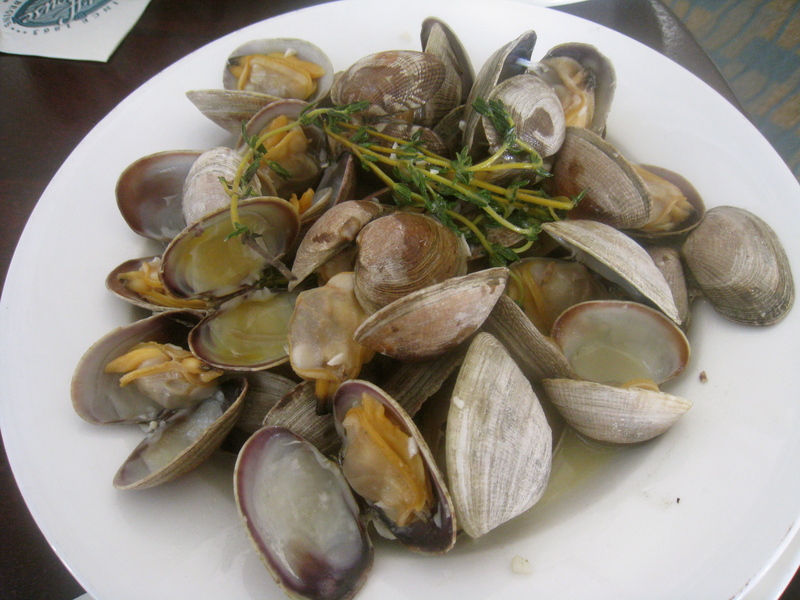 Steamed clams in a white wine based garlic-thyme sauce. Surprised at the generous portions – I mean this is a pretty upscale place and usually the more expensive the meal the less food you get. The flavors were pretty wonderful, smooth and a little tangy, until CRUNCH. Discovered a few grains of sand in my clam. As far as texture goes, I don’t think anything is worse they feeling sand in your teeth. My parents always taught me that I should always try things and if I didn’t like it I could spit it out. That’s pretty much exactly what I did. I straight up stuck my fingers in my mouth and yanked out a half mangled piece of clam. Pretty sure a few other patrons saw me – I didn’t even care. I am sad to say it wasn’t an isolated experience. At least 4 clams had sand. Not sure if that was a half-assed cleaning job on the chefs part or how to circumvent that myself, either way I chewed my clams with skepticism afterward though. I will eat them again, no doubt, ’cause their sweet taste really is excellent. Next up were the oysters. 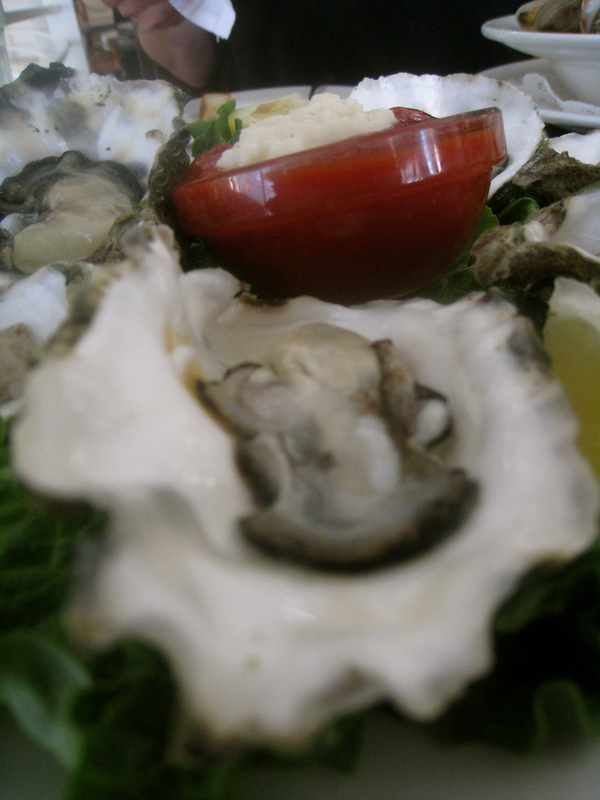 It was our first time eating them and based on their price at the grocery store (about 1.74 per oyster), I was expecting pure ecstasy in the form of raw shellfish. 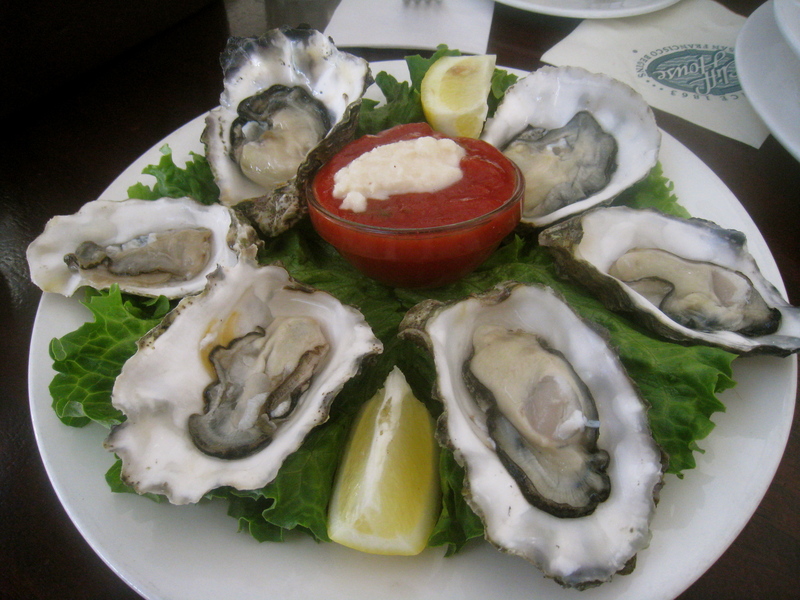 Oysters in a half shell with a marinara-horseradish sauce and fresh lemon wedges. Well, I don’t really see what all the fuss is about. Personally didn’t think they were all that amazing. They were slimy, had a weird flavor, and felt a little like what I imagine a cold snot ball sliding down my throat would feel like, since chewing it didn’t break it into pieces. Oh and I found a piece of shell wedged in one of the folds. The sauce was nice and spicy though. Maybe oysters are meant for a more refined pallet, not fit for the flavor repertoire of a girl who consideres Nutella out of the jar to be one of her favorite desserts. I think I will try them again just to be sure. 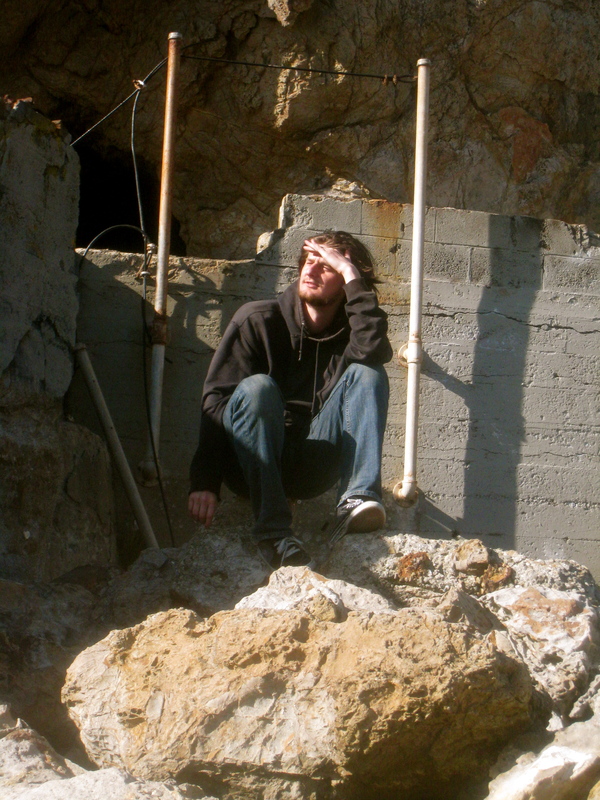 Not so sure I want to eat at the Cliff House again though. Yes, they are a fancy enough restaurant that they brought out some wonderful warm sourdough bread for us to munch on while we waited and then to use to soak up the clam sauce. However, upon adjusting the white cloth napkin (after already taking a bite of the bread) Matt found a curly, blond hair in the basket. Neither of us are blond, let alone have curly hair. I am hoping, and praying, that the employees wash their hair regularly. 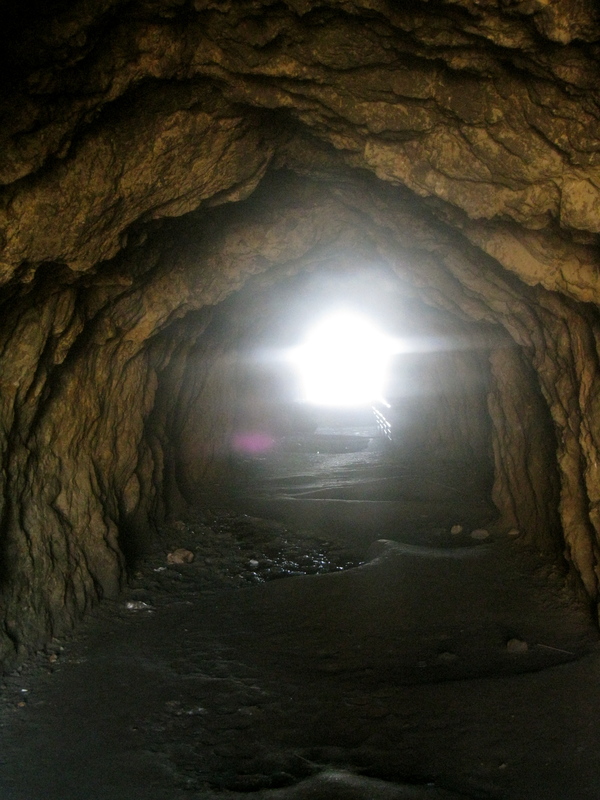 This entry was posted in Uncategorized and tagged caves, clams, Cliff House, fish, garlic, healthy, lemon, Oakland, ruins, seafood, sushi, Sutro Bath House, thyme, white wine by kristinakerley. Bookmark the permalink.